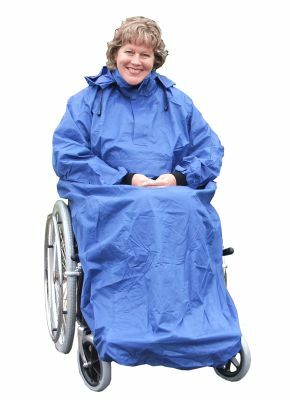 Wheelchair Clothing Koverall With Sleeves Soft Cuffs.. There is a security pouch on the front of the garment that can be used for those bits and pieces; it also cleverly doubles as a storage bag for the Koverall, ensuring that it remains tidy until required. The Koverall with sleeves is the perfect garment for those who require a high degree of independence or wish to propel themselves. Just what we required to take on trips out in case of showers, folds small to fit in a bag, good quality material.